Growing up I remember reading several different book series. My Uncle J and Aunt A hooked me on the Polk Street School books by Patricia Reilly Giff. I recall going out with them to have pizza, playing Pacman at the arcade and going to the book store to get something to read. There were other series that I read as a child. I quickly became a fan of the Ramona Quinby books by Beverly Clearly. In addition to this, I loved the Anastasia Krupnik books by Lois Lowry (author of Number the Stars) and adored reading about Peter and Fudge in the books by Judy Blume. As a college student who was an education major, I read a lot of children’s literature. Some of these include Harry Potter (J.K. Rowling), Junie B Jones (Barbara Park), Cam Jansen Mystery books (David A. Adler), Series of Unfortunate Events (Lemony Snicket) to name a few. As a teacher I read even more. While teaching Language Arts I read many of the books that my students were reading outside of class to keep up with their interests. This past summer we decided that NHL was ready to start listening to chapter books with us. 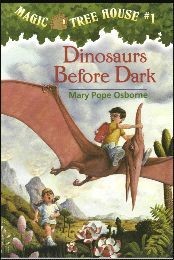 I had bought a copy of Dinosaurs Before Dark, the first book in the Magic Treehouse series by Mary Pop Osborne. Originally I started reading the books with NHL, but soon JL took over and it became a nightly thing for them. Over the months the boys have been reading the books here and there. Last night NHL and JL finished book #40 in the series. Today I requested the newest book from the library. What series of books did you read as a child, or did your children read, that you would recommend for a little boy? NHL is in kindergarten and loves to read so the more ideas the better. Ah, not sure I have any great recommendations. I pretty much stuck with “choose your own adventures”. Are they still around? Oh, Sweet Valley High. But I am pretty sure a boy wouldn’t like those! ;-) Happy Friday!! I used to read the nancy drew series and the Bobsy Twins. Oh what about the Encyclopedia Brown series..??? I loved those as well. phyllis’s last blog post..It’s a "hand" bag! I read Nancy Drew Books. My oldest son read the Tarzan books and he loved Michael Crichton. My oldest grandson reads anything and everything. as a kid I read all of the BabySitter’s Club books. I even tried to start my own. :) I loved the Ramona books and still think of her kitty cat Q’s whenever I write a letter Q. I also read R.L Stines Goosebumps as well as most of his others. In highschool I started reading V.C Andrews and have all but a few books she, or her ghostwriter,have ever written. I read Sweet Valley twins, Baby sitter’s club,ramona (my Fav) and the little house on the prairie which I hated but my parents made me read them lol! Jennifer’s last blog post..“our little secret” Giveaway! The Hardy Boys … loved them as a kid and they are more geared towards little boys. I read the Beverly Cleary books about Ralph and the Motorcycle. I think it was a series, not sure. Kim @ The Mom Trap’s last blog post..Does Your Personality Match Your Birth Order Traits? I used to like the Nancy Drew Books. I loved Peter Pan and The Secret Garden. I read a lot of books but I don’t remember the names. When I was little I loved to read “The Bobsey Twins” and “The Secret Garden”. I love the book “I wanna Iguana”. Its so adorable! I also love the Harry Potter series. I grew up as a reluctant reader. And my father was the author of over 70 books. Now I write action-adventure and mystery books especially for boys. My blog, Books for boys, http://booksandboys.blogspot.com is # 4 on Google today. where the wild things are…harold and the purple crayon…remember the night rainbow…the velveteen rabbit. i loved those when i was little. when i was older: anything christopher pike, babysitters club, and there was a series about pen pals – but the name escapes me at the moment. I remember reading Laura Ingalls Wilder Little House on a Prairie series. I loved Pippi Longstocking, Beverly Cleary books, the Little House books. My boys also enjoy the Captain Underpants and Diary of a Wimpy Kid books…. My boys enjoyed the Captain Underpants,Goosebumps, and all of my children loved Mrs. Piggle Wiggle. Of course my daughter-she loved it from the get go. I loved the Laura Ingalls Wilder series…but, for boys I’d go with goosebumps or Harry Potter! Magic Treehouse is a series that my son ran through but now he’s on to the Star Wars series. All the books you just listened I have read. Another series I loved was the Little House books. I loved….and now my son loves… Mickey in the Night Kitchen. The book is so ratty from being read over and over agian. He will even sleep with it some nights. Books are a wonderful thing! Kelly’s last blog post..Aloha Friday- How did that happen so fast? As a tomboy I always liked the Hardy Boys…best I can do for now. alliry’s last blog post..Aloha Friday! I used to read the Baby Sitter Club series–I was addicted! As a kid I loved Nancy Drew and Trixie Belden. My boys liked all you listed. All of mine were early readers, so we did not read many series as a family. The Spiderwick series is really good! 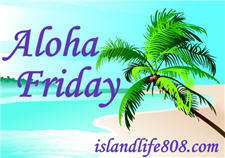 Michelle’s last blog post..Aloha Friday! I have the same problem so no suggestions. :) I’ll be writing down some ideas for the replies though!